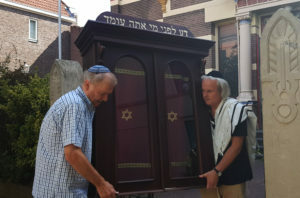 DEVENTER, Netherlands (JTA) — Four years ago, Tom Furstenberg proudly carried into his synagogue its first Torah scroll since the Holocaust, when local Nazis destroyed the building’s interior. The scroll’s introduction in 2014 was an important moment for the Beth Shoshana Masorti community that Furstenberg helped establish in 2010 in this city of nearly 100,000 residents located 60 miles east of the capital Amsterdam. “I felt that this was it, nothing could reverse our presence as part of this city,” Furstenberg, a 49-year-old teacher and chairman of Deventer’s Jewish community, told JTA on Monday. The building housing the Great Synagogue of Deventer was sold in January by the church that had owned it for decades. The developers, a Dutch-Turkish restaurant owner and his associate, then evicted the congregants amid a legal fight over the owners’ plan to turn the place into an eatery. For Deventer, the eviction meant “the end of a Jewish presence in this city,” Sanne Terlouw, a founding member of Beth Shoshana and a renowned author, told JTA with tears in her eyes on the day of the move. On Monday, the congregation gathered one last time for a snack in the building they had just emptied of its possessions. Sipping black coffee and eating prune cake, they sang in passionate Hebrew “Am Yisrael Chai” and “Kol Ha’Olam Kulo” — “The People of Israel Live” and “The World is a Narrow Bridge.” Some of the congregants cried; others tried to console them. The affair prompted intense interest internationally. JTA’s video report of the community leaving the shul has been viewed more than 200,000 times on Facebook. Ronny Naftaniel, a founder of The Hague Jewish Heritage group, said the synagogue’s sale is unusual “for a city such as Deventer, where authorities have a high awareness for heritage.” Deventer, where wealthy Jewish cattle dealers left an indelible mark and where a part of Naftaniel’s family lived before the Holocaust, “could have set aside this space,” he said. Until recently, Furstenberg’s community was able to hold on to its synagogue thanks to the Christian Reformed Churches group. It bought the building in 1951 from the severely depleted Jewish community of Deventer and turned the structure into a church, complete with a massive pipe organ that the group installed. 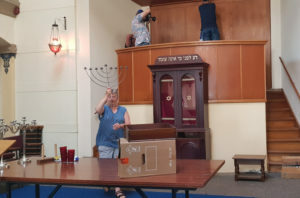 In 2010, Furstenberg and other Jews from the area began convening at a nearby Jewish club and asked the church’s permission to re-establish a synagogue in the hall, which they began renting from the church at a subsidized rate. But the church had to sell the building this year. The highest bidder was Ayhan Sahin, the Dutch-Turkish developer, and his associate, Carlus Lenferink. Amid negotiations with the Jewish community, Sahin was quoted as saying: “If need be, I’ll turn it into a mosque,” according to De Stentor regional daily. He later said he would allow the Jewish community to stay, “but only if they pay full rent” – an unlikely prospect for the small congregation, which has no sources of income and could barely afford maintenance fees when it rented the shul at a subsidized price from the church. Furstenberg’s j’accuse, spoken in Dutch in the presence of local reporters, was a reference to the unusual and painful wartime history of the building. Unlike most Dutch synagogues, the one in Deventer was not confiscated in the orderly and methodical Nazi manner. Instead it was ransacked by a rabble belonging to the Dutch Nazi party, NSB, on July 25, 1941. But that violence paled in comparison to the deportations of the congregants the next summer. Of the 590 people registered as Jews in Deventer in 1942, the Nazis murdered 401. It was a typical statistic in a country where the Nazis and local collaborators were responsible for killing at least 75 percent of Jews – the highest death rate in Nazi-occupied Western Europe. Simon van Spiegel, his brother, Bubi, and Meier de Leeuw hid in the building’s attic for a while. Bubi was caught by the Germans after they received an anonymous tip. His brother and de Leeuw escaped. Simon’s daughter, Liesje Tesler-Van Spiegel, who lives in Israel, visited her father’s hiding place for the first time last month. “I remember all of them,” Roelof de Vries, 86, a carpenter whose family worked as caretakers at the synagogue before the Holocaust. “Even if this place becomes a restaurant, I’ll never forget my friend Bubi, whom they gassed along with so many others,” he said, weeping.